Mercedes-Benz has improved its E-Class range with a facelift and increased standard equipment. Most importantly in the eyes of many potential buyers, they have significantly improved engines, including a sensational new powerplant tagged as the ‘400’ – more about it later. Safety has been significantly upgraded as Mercedes continues to be in the forefront in this field, as it has for many decades. Though the profile of the superseded E-Class cabriolet and coupe worked well, the frontal styling was hampered by having too many awkward shut-lines. The new look has corrected that and the Mercedes is significantly neater. So great is the alteration to the appearance that it’s hard to believe the bonnet and front guards remain as before. Cleverly, the frontal appearance changes haven’t interfered with the low coefficient of drag of just 0.24. Inside, the latest Mercedes-Benz E-Class cabriolet and coupe retain the same overall design theme as before, with the exception of a reworking of the central area of the dash. Changes to the colours and finish of the materials complement these changes and the overall feel is significantly different. The biggest news in the E-Class range is the introduction of a new V6 engine in the model called the E 400. No, it isn’t a 4.0-litre unit, but displaces just 3.0 litres. However it achieves V8-like performance thanks to its twin turbochargers and uses noticeably less fuel than the V8 it supersedes. With up to 245 kW of power the turbo V6 has a huge 480 Nm of torque all the way from 1400 to 4000 rpm. On our road test spread over a great week on the Gold Coast we loved the effortless surge of torque. The Mercedes biturbo engine not only makes for effortless long distance touring, but also increases safety of overtaking on tight country roads because of the minimum distance spent on the wrong side of the road. The seven-speed automatic transmission worked smoothly and well, however it may soon be superseded by a nine-speed unit that will presumably be even better. Mercedes’ Comand infotainment system is, as usual, simple and generally intuitive to use. The large screen is easy to see with a minimal of inattention. The Harman Kardon sound system fitted to the E 400 has the sort of excellent quality normally only found in upmarket home audio systems. These mid-sized Mercedes have many crash avoidance features, including some that haven’t yet been introduced in the much more expensive S-Class (though the next generation S-Class will catch up when it arrives in a few months). The Mercedes E 400 looks for potential dangers for 360 degrees around itself and brakes and steers as necessary, at the same time warning the driver to take action. There’s also lane keeping assist, radar cruise control and pedestrian collision protection. If you should still have a serious collision these Mercedes E-Class sports models will do their very best to prevent or minimise injuries. It goes without saying the E-Class easily gained five stars in European crash testing. Cabin space is better than you might anticipate in a cabriolet, though it does require moving the front seats forward to share legroom if adults are being carried in the rear. Two adults and pair of pre-teen children will do it easily. 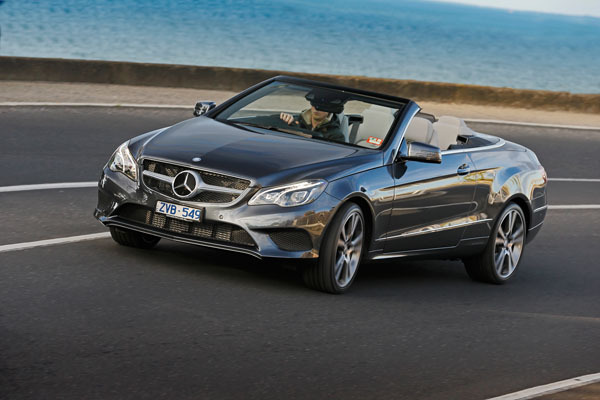 A clever device called an Aircap rises from the top edge of the windscreen in the cabriolet and lifts the airflow by about ten centimetres, making a surprising difference inside the E-Class car when the top is down. 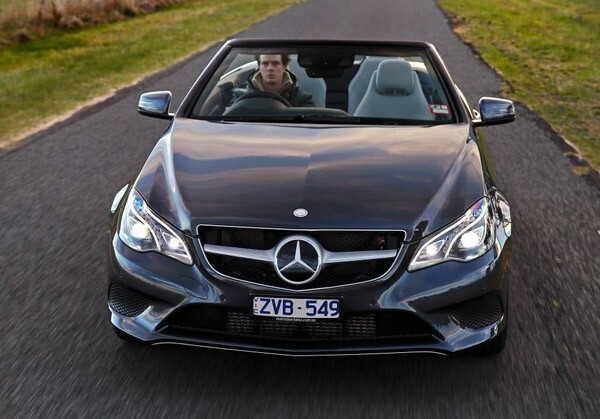 We have test driven the sporting E-Class models in Germany and Australia. Tyre noise on the notorious Aussie coarse-chip surfaces doesn’t intrude overmuch, even in the cabriolet when the roof is open. Big bumps and dips are generally dispatched with only the mildest of tremors in the cabriolet. We did bottom out the suspension when pushing hard over big undulations, but you have to keep in mind these are low slung sports models and have to be treated with care on rough and ready Australian backroads. By the way, we found cruising an E-Class cabriolet at 180 km/h is ridiculously easy in Germany. The laws of automotive physics are different in Australia, and though we did push our review car all the way to 112 km/h on a motorway here, we thankfully didn’t crash. Handling is excellent due to the low centre of gravity, as is the balance offered by the front-engine rear-drive layout and by the dynamic precision the suspension offers. 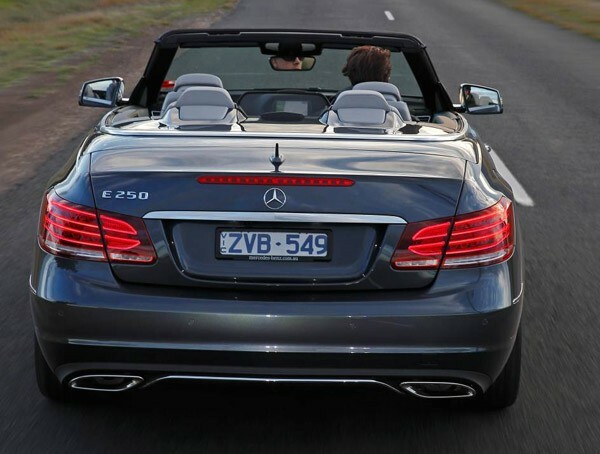 Though the E 400 E-Class cabriolet we tested had a recommended retail price of $142,900, the range now begins under $80,000 for the first time. The $79,990 (plus on-road costs) E 200 coupe is a relative bargain in this upmarket class and we can see the new sporty Mercedes continuing to sell well downunder. Note: These prices do not include government or dealer delivery charges. 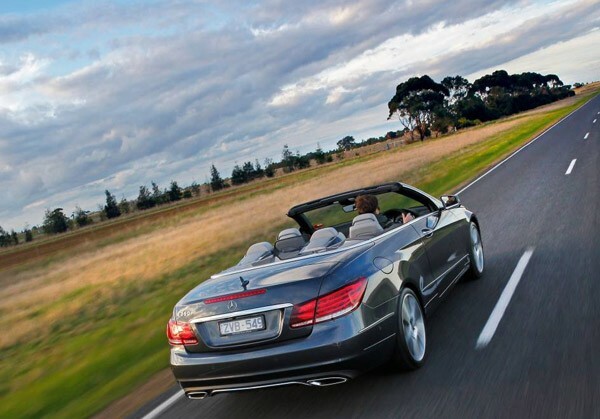 Contact your local Mercedes-Benz dealer for driveaway prices.